Here are some miscellaneous photos I have taken over the years of Federal sirens and a few photos from other sources. At the bottom of the page is a description of Federal Fire Signal Sirens. 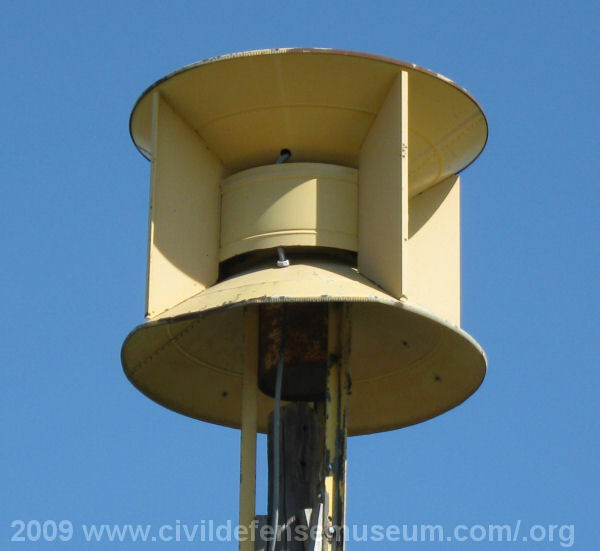 The Federal Model 2 is a small siren that Federal states produces 102db and 100ft. It is a single phase 2hp siren and is single tone. Federal also made dual tone Model 2T. The Model 2 single tone siren has 5 ports and the dual tone Model 2T has 4/5 ports. Federal states in their old Model 2T manual that the Model 2T had an output of 100db at 100ft. Here's a close-up photo of a STH-10 at the Richardson fire training facility. This siren was almost in new condition when this photo was taken and I don't believe was ever installed. It was sold at auction in 2008. The STH-10 model siren has 12 ports, is single tone with a 7-1/2hp motor. That's the motor on the top of the siren in the picture. The large tube on the bottom where the stand legs attach is the air intake tube for the siren. The Federal STH-10 manual states the sound output as 115db at 100ft and a top sound frequency of 694hz. 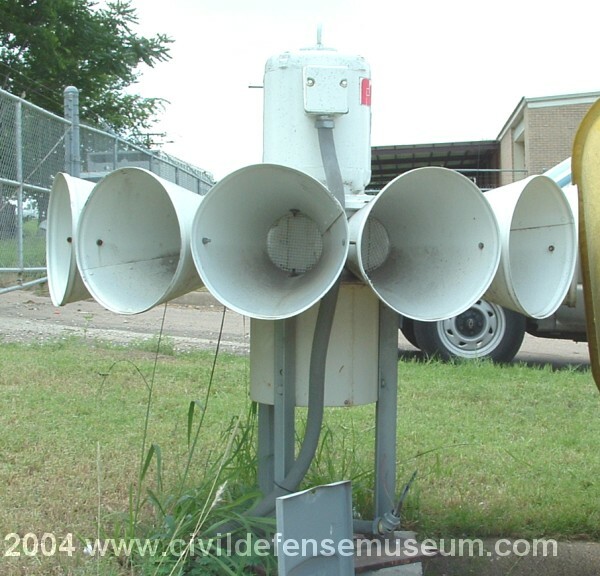 I think the Federal 2T22 is probably the nicest sounding of all the dual-tone Civil Defense sirens. The 2T22 is essentially 2 sirens using one motor. The upper part of the siren has 12 ports and the lower has 10 ports resulting in 2 tones produced and it is driven by a 10hp motor. The motor is in between the two siren rotors. The air intake for the upper siren rotor is just under that little hat on the very top of the siren. The air intake for the lower siren rotor is (like the STH-10 above) through the tube between the siren mounting legs at the bottom of the siren. Actually when the City of Allen put this siren up it was mounted to the pole incorrectly. The pole extends up into the lower rotor air intake which must have blocked a large volume of the incoming air. The tone frequency is 675hz high and 575hz low tone. I'm not sure what the production span of this siren was. I'm guessing it came out in the 1960s some time and then Federal stopped production in the late 1980s or early 1990s? There is also another version of this siren, the 3T22 which is capable of producing the fire signal. See a detailed explanation of the 3T22 at the bottom of this page. For a nuts and bolts breakdown and description of the 2T22 check out my 2T22 Repaint Page. The Federal SD-10 is a dual tone siren with a 7-1/2HP motor. It's similar to the STH-10 and STL-10 in that the motor is on the top and the air intake is on the bottom. Obviously the housing on the SD-10 is the most unusual thing about it. Evidently since the SD-10 is dual tone and individual projector horns wouldn't line up with two separate rows of different number siren ports Federal went with this unique housing. The whole housing is like a projector horn. The siren had one row of 12 ports and one row of 9 ports resulting in a 4/3 port ratio. The Federal manual states that the SD-10 has a high tone frequency of 694hz and 521hz low tone and the sound output is 109dB and 100ft. 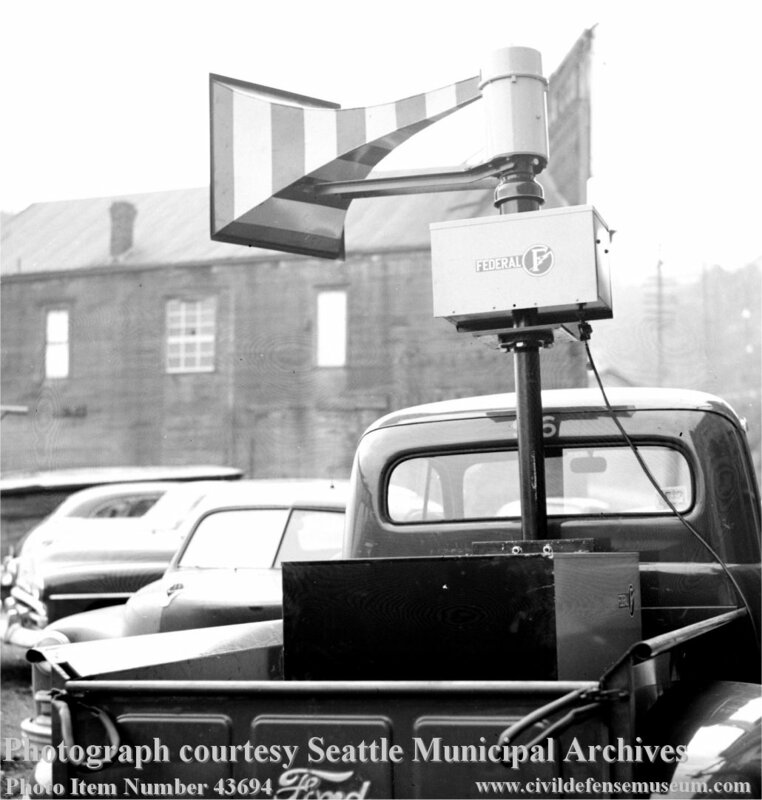 The Federal Thunderbolt siren was developed in the early 1950s specifically for civil defense warning use. The Thunderbolt was a unique design because it used a high power air pump (roots blower not a compressor) to force a high volume of low pressure air through the siren rotor (chopper) which kept the sound output of the siren at full volume throughout the chopper pitch range. 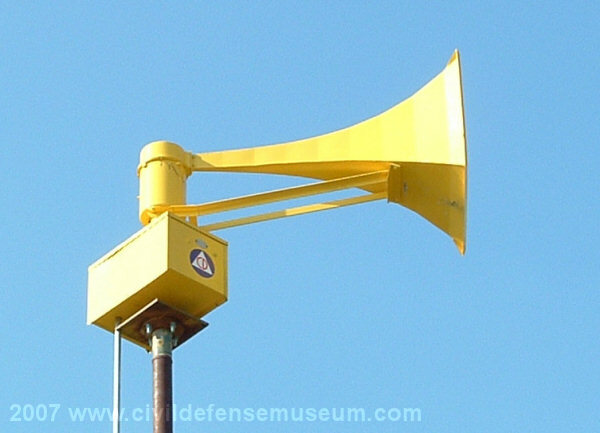 When the Thunderbolt sounds the civil defense attack signal (often described as the on/off, up-down or wavering signal) as the chopper speed would change the siren maintains full sound output. The Thunderbolt also had the feature of being able to set the maximum pitch (speed) of the siren chopper by various voltages from 110 to 230 in 20 volt increments on the chopper control transformer in the control cabinet. I don't know of any other warning siren that had that feature. Both the single tone (Model 1000) or the dual tone (Model 1000T/1003) Thunderbolts have very distinctive sounds due to the blower they use to force the air through the siren chopper. The Thunderbolt's somewhat "vwooping" (I can't think of any better word to describe it) style up and down pitch changes make it noticable for very long distances when the actual sound level of the siren isn't that loud at those distances. For a fairly complete nuts and bolts breakdown and description of the Thunderbolt siren you can check out the other Thunderbolt siren sections linked to on the warning sirens main page of this site. 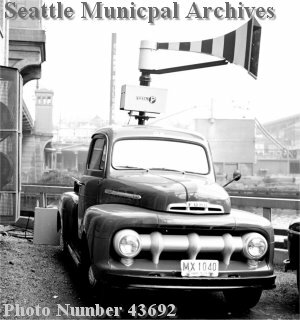 I found some fantastic photos on the Seattle Washington Municipal Archives web site. They have a large number of vintage photos in their archives. Among these photos are these two of a mobile Thunderbolt siren mounted in the bed of a Ford pick-up truck. 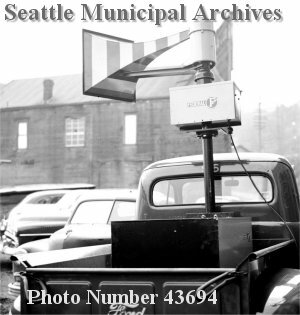 These photos are dated February 1952 so this must be one of the first Thunderbolt sirens. Notice in the photo of the front of the truck that the RCM control cabinet can be seen behind the truck. It looks to me like they were testing their new Thunderbolt with a temporary hook up. I can't figure from these photos where or how this siren would have been used. The horn is mounted so low above the cab I think that the vehicle would have to have been driven to a location with a high elevation and hooked up to remote power to operate it. I don't know. Maybe this is a demonstration vehicle that came from Federal to demonstrate the siren. Well I don't know about that either. I just noticed that the truck has a Washington license tag on the front. Maybe the Federal sales rep. was in Washington. Who knows... Just another unanswerable question lost in the forgotten history of civil defense. I emailed the archives and they were kind enough to take the time to scan the negatives for some high resolution photos. 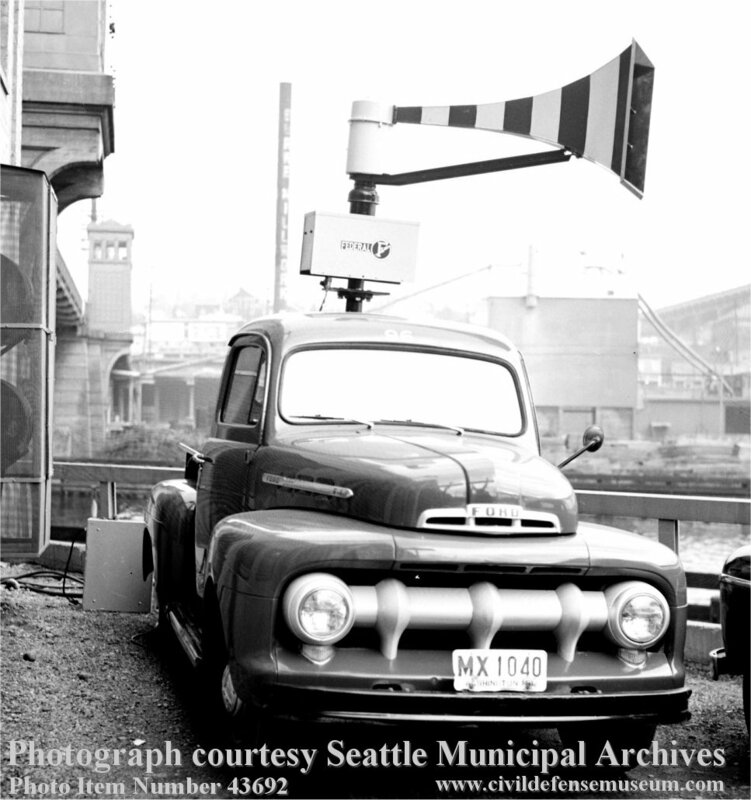 I recently came across your website by accident, and spotted the two Seattle pictures of the siren mounted on the Ford pickup truck. I am an employee of the City of Seattle, and can (if nothing else) give you the exact location that the pictures were taken at. The site is the East side of the Southern approach to the Freemont Drawbridge. It is now and has been for many years the location of our Drawbridge Operations and Maintenance Shop. This bridge is one of several drawbridges across the Ship Canal that bisects the city from East to West. From the license plate, I strongly suspect that this truck belonged to the City. I can't imagine a more unlikely place to test a siren, unless they wanted to minimize it's sound impact on the surrounding area. There is a very steep and high bluff located not far behind where the photographer would have been standing. An earth embankment as well as the concrete bridge structure are blocking sound to the West. Some of the buildings seen in the background still exist." 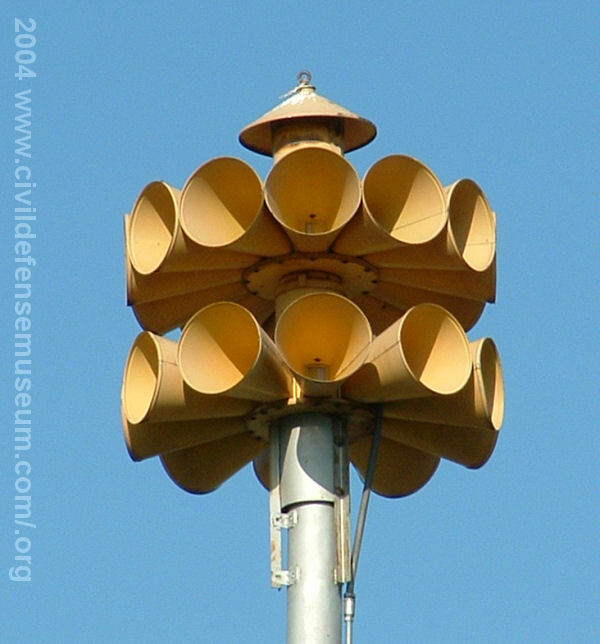 In the earlier years of outdoor warning sirens several siren companies made what were called "coding sirens." These sirens were standard mechanical sirens in that they had the usual spinning rotor with ports which produced the siren noise but these coding sirens had additional mechanical valves on the air intake or around the siren stator to open and close the air flow through the siren. These air valves were operated electrically with motors or solenoids which allowed the siren sound to be cycled on an off rapidly with the siren rotor still spinning. Coding sirens were used to signal using their pulsed sounds "codes" to designate a certain area of town, or a certain fire stations, etc. 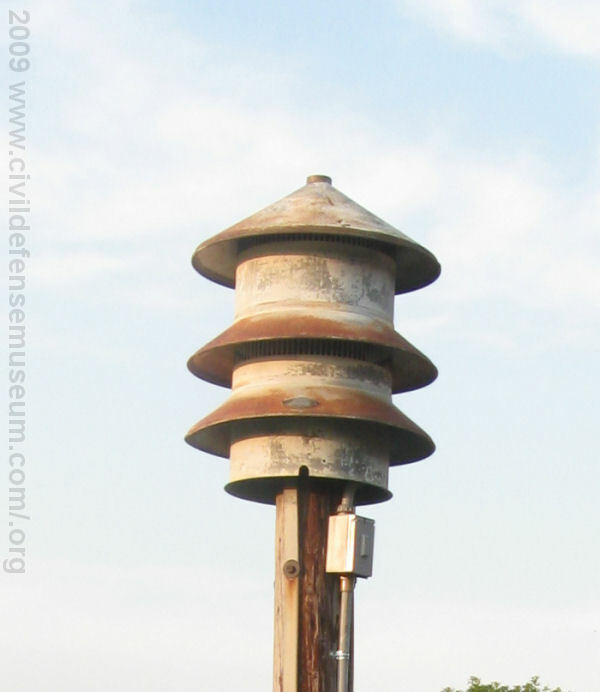 Since many communities with volunteer fire departments used sirens to call-in their firefighters in time of emergency a special "fire signal" was developed by Federal Signal so that two of their sirens for civil defense warning use could also be used to call-in firefignters using that special coded signal. The Federal Thunderbolt 1003 and 3T22 are capable of coding the "Fire" signal using air valves to alternately cycle on and off the air flow through the high and low tones of their dual tone rotors. The 3T22 used air valving on the air intakes of the upper and lower siren rotors. The Thunderbolt 1003 used air valves on the stator to close air flow coming out of the siren rotor. This alternate cycling resulted in a Hi-Lo alternating signal. The hi-lo fire signal was devised to be very different from the Civil Defense Alert and Attack signal. This hi-lo fire signal was controlled by an electromechanical traffic light signal flasher unit located in the siren control cabinet. The sirens are also capable of doing other signals as well by various switching methods of their air intake valves. Some of those are shown with my Thunderbolt 1003 in the videos at the bottom of this page. 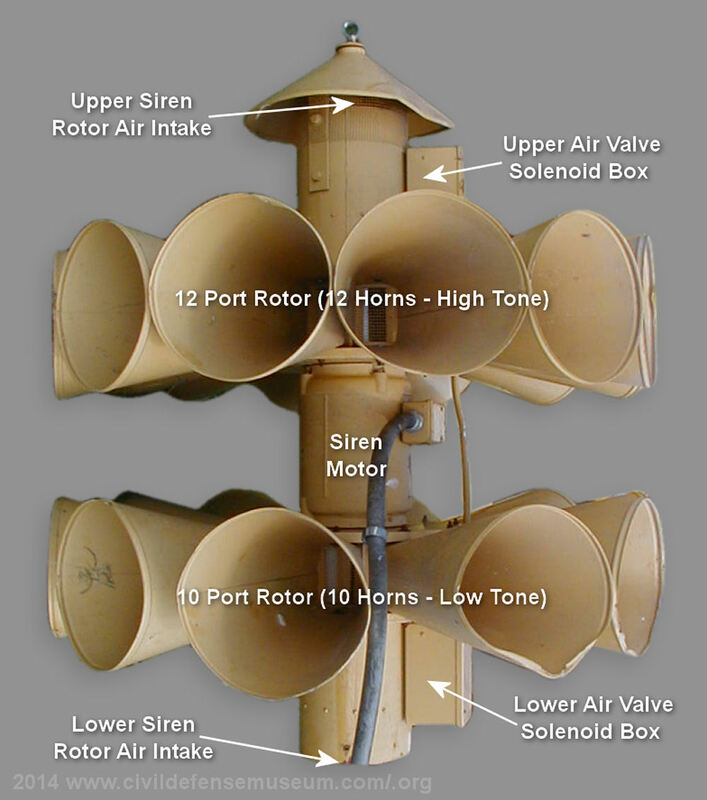 The Federal 2T22 siren is a dual tone siren, which is made up of one 12 port siren (high tone) on top of another 10 port (low tone) siren with the electric motor in the middle. Federal added air valves to each siren air intake of the 2T22 siren to make it possible to alternately (or simultaneously) shut off the air to each air intake of the siren. Shutting off the air intake virtually silences the siren because it closes off the air flow into that part of the siren. This type of 2T22 siren with air valves was desingated a 3T22. The Fire signal of a 3T22 is somewhat musical sounding because the 2T22 has such a nice sound to begin with. The Hi-Lo Fire signal of the 1003 Thunderbolt sounds similar but more "mean." Of course that just goes with the territory since the Thunderbolt is such a "mean" sounding siren. It's the blower that gives the Thunderbolt is distinctive "mean" sound. If you have never heard a siren do the Hi-Lo fire signal here is a very nice recording by Brett Jones of a 3T22 doing the signal. The above photo was taken looking into the bottom air intake tube of a Federal 3T22 siren. Just visible behind the air intake screen, inside the air intake tube, is the lower air intake air valve. At the top of the photo you can see the lower air intake tube air valve solenoid box. This box houses the solenoid that closes the air valve. The air valve is held open by a spring and is closed when the air valve solenoid is energized. The upper air intake tube on the 3T22 has the exact same air valve arrangement as the bottom air intake tube. The 3T22 uses the same air valve solenoids that the Thunderbolt 1003 uses. (See 1003 Section Below). The above photos show a comparison between the Thunderbolt 1000/1000T chopper/rotator and the Thunderbolt 1003. You can see in the photo that the 1003 has a taller rotator box and and the additional feature of a solenoid housing between the horn and the chopper housing. The housing at the base of the horn on the 1003 contains the air valves and solenoids. The tubes coming off of each side of the housing contain the wiring to the solenoids. The wiring is connected to a set of brushes and a collector rings inside the rotator box. See detail of the solenoid housing at the bottom of this page. Only the 1003 Thunderbolt has this housing at the base of the horn. For more detail about how the Thunderbolt siren works see this section. Thunderbolt Restoration. Here are two photos of the different types of Thunderbolt choppers. This is what the chopper rotor looks like with the top cap (stator) removed. 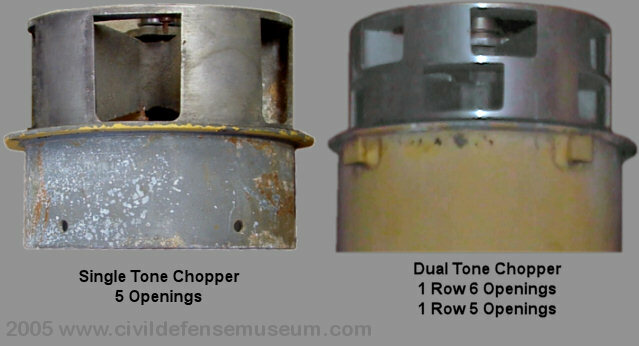 The single tone chopper on the left has five large openings and the dual-tone chopper on the right has an upper row of six (high tone) openings and a lower row of five openings (low tone). The two rows of openings on the same chopper cause the siren to have a dual-tone sound. The two air valves in the 1003 solenoid/air valve housing (see below) act to close off the different rows of ports. The air valves are held open with springs and are only closed when the solenoids are energized. There were also a limited number of Thunderbolts issued with a 4/5 port chopper like the Federal Model 2T had. I don't know if there was ever a Thunderbolt 1003 that came from the factory with a 5/4 port chopper. Federal couldn't have easily stopped the incoming air to the 1003 separate rows of chopper ports since the siren rotor (chopper) is located in a closed housing with the air/stator outlets at the base of the horn. Threre is also the air supply that is forced through the chopper by the blower to deal with which could be valved but that would only produce a pulse signal and not the hi-lo fire signal. The 1003 uses two solenoid activated air valves to close off the air coming out of each half of the chopper. Alternately closing each valve causes the 1003 to do the Hi-Lo Fire signal. These valves can also be switched on and off simultaneously to cause a pulse signal. See videos at bottom of page. 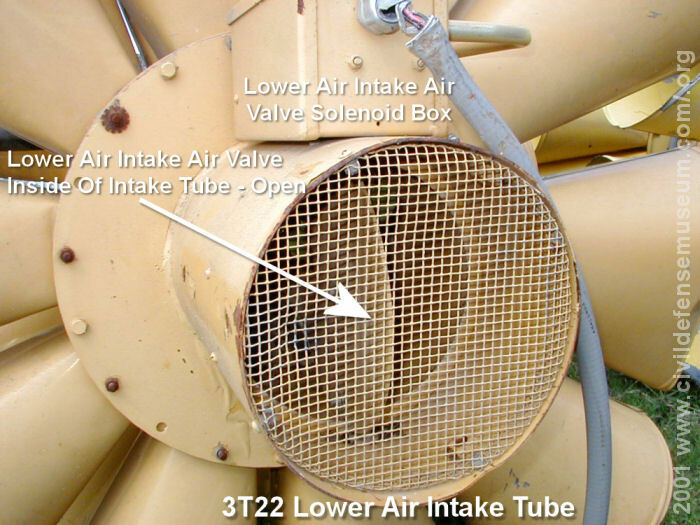 The above photo shows a plan-view photo of the 1003 solenoid/air valve box showing the low tone solenoid (left) air valve (center) and the high tone solenoid (right). When the solenoids are at rest the air valves are open. When the solenoids are energized they close the air valves. The springs attached to the solenoid plunger hold the air valves open. Click photo to see larger version. Videos Demonstrating The Thunderbolt 1003 Solenoid Operation. Here's a short video showing the solenoid operated air valves of a Thunderbolt 1003 siren. The siren rotor (chopper) is not running in this video. This is the first video I made showing the valve operation of the 1003 air valves. I manually switch the solenoids in this video. I don't engage the hi-lo flasher unit in the control cabinet. Completely Ridiculous Video I Made When I Had Two Thunderbolt 1003s. Hi-Lo. This is one of my more ridiculous videos. I run the two 1003 choppers in hi-lo at the same time. Actually it really wasn't that loud. I start the 1003 I got from Sherman Texas first. If you notice there is no hi-lo singal speed up when the signal starts because that siren has the hi-lo flasher I built myself. When I start the second 1003, that siren came from Arkansas, you can hear the hi-lo singal alternating is very slow and then speeds up. This is because it has the original hi-lo flasher in the control cabinet. The hi-lo flasher I built uses a 60 rpm clock motor and the Federal hi-lo flashers use an eddy current disc motor and it takes a few seconds to get up to speed. In this video I hook up the air valve solenoids of the 1003 from Sherman Texas to one side of the control flasher to make both solenoids operate at the same time which makes the siren do a pulsed signal.